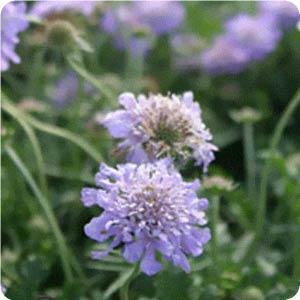 Description: Scabiosa Butterfly Blue, of course, attracts butterflies as well as bees and birds with it’s light lavender-blue flowers. The blooms are pincushion-like on long spindly stems with ferny foliage. Spacing: Plant 12″ to 18″ apart. Height: Grows 12″ to 18″ tall. Outstanding Features: The Butterfly Blue Scabiosa attracts butterflies, bees and birds.